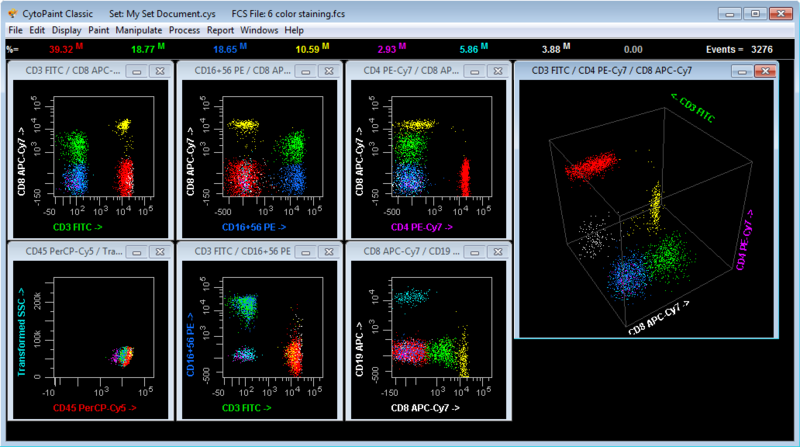 CytoPaint™ Classic’s user interface presents a powerful, yet simple-to-use environment for analyzing your multiparameter samples. Click on the plot to zoom in. Display data with biexponential scaling. Right-click contextual menus on plots to access common functions. Calculate absolute counts for any population using BD Trucount™ tubes or other counting particle. User-definable compensation control. Import/export spillover matrices from multiple formats (FloJo/BD/csv). Calculate a compensation spillover matrix from control beads using Auto Compensation function. Calculate robust statistics, including median, rSD, rCV and percentiles. Automatic and manual cropping of displayed data. 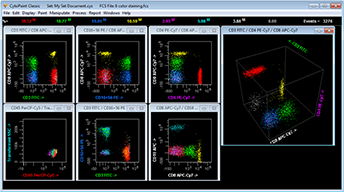 Special functions for analyzing FCS files acquired from BD Accuri™ C6 instruments. Perform advanced color (population) manipulation with Color Zap, Color Exact Zap and Color Memory. Draw 2D dot plots using any of three painting algorithms. Choose three parameters and AutoPaint your data. Record and playback mouse activity and menu commands to create reproducible analysis methods. Batch analysis allows automated processing of multi-tube panels. Customizable reports for each experiment. Intuitive interface for configuring statistical results output. Send results to a spreadsheet-ready output file. Collapse the first decade of digital data.